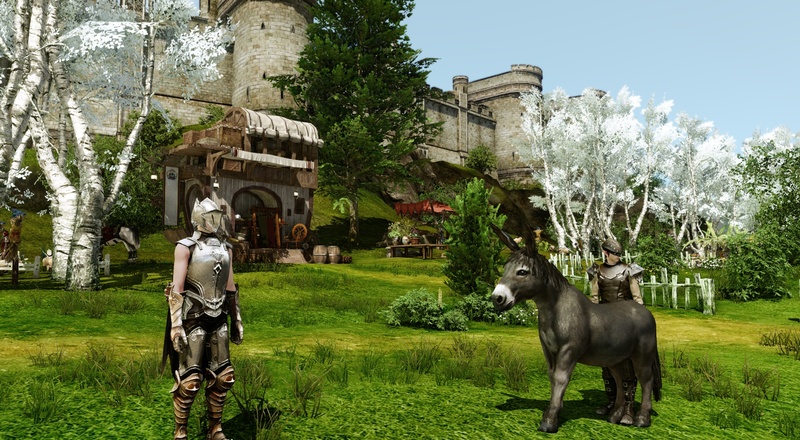 The fantasy economics systems of Trion's Archeage might rival CCP's EVE Online. There are many MMOs which are so similar that it's often hard to distinguish them. The skins of the classes or combat systems may differ, but the core gameplay is still kill dudes, get loots, gain levels. In Trion's Archeage, you can still do all those things, but the core of the game is to become rich, famous and maybe even powerful. Here's how it works: Once you get past the game's starting areas, which are unique to each race, you'll eventually have to cross the Sea of Serenity. The devs playfully call this massive open world PvP area the Sea of Slaughter, because it's terribly dangerous to traverse on your own. In the Sea of Serenity is the Land of Origin, and players can build castles and other structures there. Other players can move onto your territory, and pay you tithes to plant farmland, etc. To build those things and craft the necessary components, you need raw resources like wood, sheep and metal. The best place to gain those resources aren't on the Land of Origin, but spread around the Sea of Serenity or back on the main continents. You have to move those resources using mounts like donkeys or cattle and eventually cross the open PvP area of the sea, and that's where it gets interesting. If you kill a member of your faction to get their stuff, you'll walk around with bloody footprints for a while. Seeing the evidence of your dastardly deed, other players can report you, and once enough reports come in you'll be arrested. A trial by a jury of peers - players - is then held and decides your jail sentence, varying from a few minutes to an hour or more. (Prison isn't necessarily unfun as you can play soccer in jail and even try to escape through a short quest if you want). Get sent to prison enough times, though, and you can exiled permanently from your faction. You'll be kill-on-sight for all the other players in the world, except NPCs who inhabit Pirate Island. Castles and farms are still possible on Pirate Island, but resources are scarce, which means the best way for pirates to get stuff is to, well, be a pirate. If you have enough resources, you can build a ship and man it with your friends and guildmates. There's different kinds of ships too, so if you're carrying a lot of valuable cargo, it may be worthwhile to form a convoy of trade ships, battleships and smaller scouts. Pirates can descend on you and board your ship, trying to sink her to gain access to the resources you've piled on. The whole enterprise sounds marvelously fun, with player personalities clearly fitting into the archetypes of crafters, seamen, defenders and the buccaneers who try to take all that away. Conflict between law-abiding citizens of Archeage is possible too, and that takes a fair amount of political skill. There's an item you can buy on the auction house for each castle which gives you the right to raid another's castle. Even if you put in a bid to buy it, the intended victim can still raise the money from friends and allies to outbid you, barring you from assaulting his stronghold. This creates an almost political sub-game in which powerful ruling houses can help protect the lesser landholders if they so choose, or to aid the attacker if you're a jerk. Inevitably, an assault can go forward, and these battles are massive PVP events that can take hours or even days. You have to have resources at the ready for your siege to build the trebuchets and stealth gliders - it's a thing - you'll need to defeat the defenders. Battles can include up to 75 players per side, so it can get pretty hairy. I didn't get to see any of these sieges in action during our short demo, but just the promise of this mayhem was enticing. There's obviously more to say about Archeage - the vistas and architecture I saw were gorgeous - but the economic engine is the most intriguing part of the game. It's live in Korea now, but Trion is tight-lipped as to exactly when it will launch in English, whether it will be free to play, or what platforms it will be on beyond the PC. I'll be in touch with Trion more as the game develops and hopefully post a hands on preview of the beta when it begins.